WASHINGTON (CNS) — When Pope Francis first stepped onto the balcony overlooking St. Peter’s Square in Rome, Mark Shriver like millions of other people around the world was captivated by this man who humbly bowed his head after asking the people there to pray for him, before he would offer his first blessing to them. Shriver wondered, who was this man from Argentina, who joked that the cardinals had gone to the ends of the earth to choose a new pope? Who was this man who rode back on the bus with the cardinals, later paid his own hotel bill, and would move into a Vatican guesthouse rather than the papal apartments? Who was this first pope to choose the name “Francis,” after St. Francis of Assisi, the patron saint of caring for the poor, protecting the environment and working for peace? Who was this man who washed the feet of juvenile offenders at a detention center, who embraced a man who had a disfigured face, who made his first trip outside Rome to an island where migrants sought safe harbor? Then a book publisher invited Shriver to write a book about the new pope. Shriver had written a best-selling biography about his dad — “A Good Man: Rediscovering My Father, Sargent Shriver” — but he felt ill-equipped to take on such assignment. He had just begun a new job, as president of Save the Children Action Network in Washington, and he had an active family life with his wife and their three school-age children. Plus, Shriver didn’t speak Spanish and had never been to Argentina, and didn’t know much about that South American country. But over the next two and one-half years, he would extensively research the pope’s life, his writings and speeches, interview close to a hundred people who knew Jorge Mario Bergoglio before he became pope, and retrace the pope’s life, from his childhood in Argentina to his papacy in Rome. 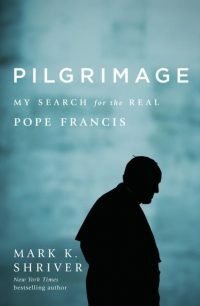 The result is Shriver’s new Random House book, “Pilgrimage: My Search for the Real Pope Francis,” which went on sale Nov. 29. “I wanted to find out who this guy is. I was trying to figure out if what he was doing is real,” Shriver said in an interview with the Catholic Standard, the newspaper of the Archdiocese of Washington. For Shriver, the pilgrimage also became a personal journey. He had grown up in a Catholic family, the son of Sargent Shriver, founder of the Peace Corps; and Eunice Kennedy Shriver, founder of the Special Olympics. 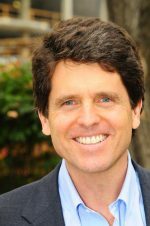 His parents attended daily Mass, and their faith shaped their lives and work, which was a key theme of Mark Shriver’s biography of his father. But the author, while inspired by his parent’s faith and by the witness of many priests and women religious, was disillusioned by the actions of some in the church hierarchy on issues such as the sexual abuse crisis. Mark Shriver had graduated from a Jesuit high school and college, Georgetown Preparatory School in North Bethesda, Maryland, and the College of the Holy Cross in Worcester, Massachusetts, and he was curious about the first Jesuit pope’s background. “Pope Francis seemed like the right messenger with the right message, a man of substance with an endearing style. His public humility, austerity, the smile, the joy all seemed to emanate from a deep reservoir of peace and self-knowledge. I wanted to dig in and learn more,” Shriver writes in the book. The pope’s home city, Buenos Aires, is a city of contrasts, Shriver points out in the book. Its grand boulevards resemble those of Paris, but are not far from teeming slums, where priests inspired by the future pope continue to serve and bring hope to the poor. There, Shriver witnessed clues to the pope’s demeanor: the warmth and affection people demonstrated to each other, and the statues of Mary at subway stations, a sign of how the Catholic faith has been intertwined in Argentina’s culture. With the help of a driver and translator, Shriver navigated the city’s streets and alley ways and interviewed those who knew Jorge Bergoglio as a priest, bishop, cardinal and friend. He visited the humble home where the future pope grew up, and learned about how Pope Francis’ grandmother Rosa — who had emigrated with her husband and son from Italy — taught him to pray and respect people from other faiths. He prayed at her bedside when she died at age 90. “She had an incredible influence on him and wrote a beautiful note he keeps in his breviary today,” Shriver said. Besides Rosa, the other great influence on the future pope was St. Ignatius of Loyola, founder of the Society of Jesus. Bergoglio mirrored the order’s founder in surviving a life-threatening lung inflammation as a young man. Shriver visited the Colegio Maximo de San Jose, where the future pope lived off and on for nearly 30 years, as a Jesuit student, provincial, rector and teacher, and he saw his Spartan room that reflected the order’s militarylike discipline, and Bergoglio’s humility and simplicity. Then future pope was a rising star in his religious order, and at a young age was named its provincial. But he later acknowledged in an America magazine interview that his authoritarian style of leadership and quick decisions were personal faults. Later, he was transferred to the city of Cordoba, where his ministries included caring for elderly priests. “How a person changes has always been the narrative that most interests me,” Shriver writes, noting that spiritual exile for the future pope offered him time for reflection on how to be a servant and leader in the church. Then-Father Bergoglio went to be an auxiliary bishop in Buenos Aires, then archbishop and cardinal of that archdiocese. Today, Pope Francis is known for his leadership style that emphasizes dialogue, listening and collaboration. The book ends with Shriver, his wife and their children having a personal encounter with Pope Francis, who offers them a simple message much like that he first expressed on the balcony of St. Peter’s. Like many pilgrimages, the one undertaken by Shriver involved a journey home, to examine his own faith and life.